Why choose America's inspector for your inspection ? We can perform stage of construction inspection, spot inspections or completion Inspections. We assure that you will be well informed about you new home. Not every new home needs a constant eye looking over the builder sholder, we can advise you and do only what is necessary for you concerns. Just call us we can help. Most all track home builders have no one to monitor and oversee the laborers and suppliers. The sales person often tries to manage the construction and the sales office at at the same time. This person often has no training and is not invested in our home being built properly. Look closely and you will see a crack line in the tile floor. This home was just completed 2 weeks ago. The slab foundation is cracked from the kitchen area to the back porch. We inspected this problem after the fact. We evaluated the crack line and recommended that the home owner have the supply lines pressured tested by an independent licensed plumber. 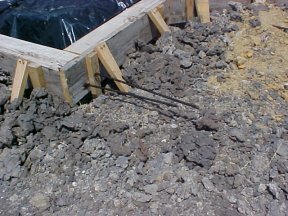 We suspected that there was a broken supply water line in the slab that was causing this problem. The owners called us back 2 days later to let us know that we were exactly right. The original builder was forced to repair the slab or build another home for the owners. Our clients got a brand new home. The estimated cost to the builder was $62,000,00. The cost to our clients for the new home was $0.00 and the builder built them a newer, better home with many extras for $50,000.00 less than the first home. 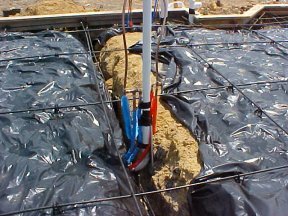 A slab foundation pour is a very important event and should be well prepared before the pour is started. 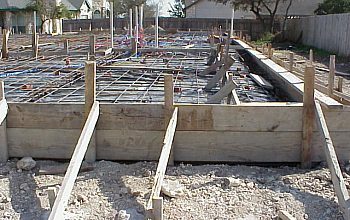 This a pre-stressed post-tension construction foundation. 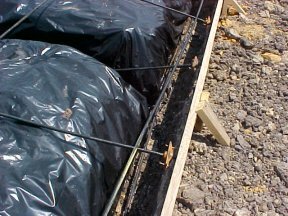 You will see the tension cables crisscrossed over the plastic vapor barrier. 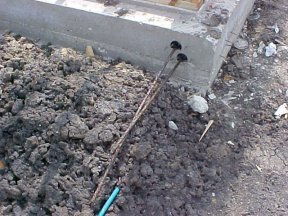 Do you want a sales person overseeing the pour of your foundation. 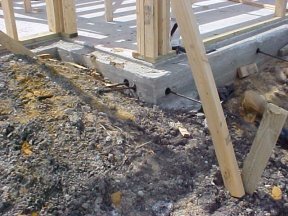 We were asked to perform a spot inspection of the foundation and wall construction on this property. The new home owners were concern that there was something wrong, but they did not know what or if it was important. The water was turned off at the water meter and there had not been any worked performed in days. We noticed that on the outside of this area the dirt appeared to have been removed and then replaced. Also, there was a outside water faucet on the exterior in this same general area. After some investigation we turned the water on to the structure, we found that the supply line was broken deep under the slab and would be impossible to get to without breaking and jack hammering to get to the problem. The builder said that they had no idea that there was any problem and that they had turned the water off to stop people drinking from there. 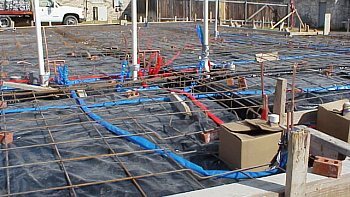 Our client were invested in the construction of the structure and only wanted the supply line leak repaired so that the home could be completed on time. They had to break up the slab in 5 areas to get to all the leaks under the slab. 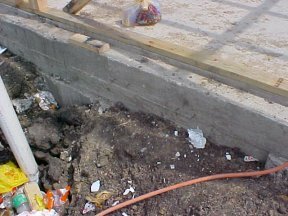 Unfortunately, as things added up the builder had to completely break out the slab foundation and start over.